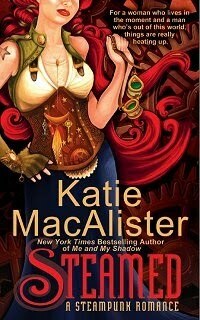 New American Library is thrilled to announce the latest novel from bestselling author Katie MacAlister’s, STEAMED (A Signet Mass Market Original Paperback; February 2010; $7.99)! This is the start of an all-new series from MacAlister which combines steampunk with her trademark witty romances. Katie MacAlister has earned her place among the top authors working in the world of paranormal romance today with her Aisling Grey, Guardian and Silver Dragons series. She’s become a regular on the New York Times, Publishers’ Weekly, and USA Today’s bestseller lists. Now she turns her attention to steampunk—an up and coming fantasy subgenre set in a time when technology is propelled predominantly by steam power. The hero of STEAMED is Jack Fletcher, a computer engineer. When one of his nanoelectromechanical system experiments explodes the impact sends him hurtling into the world of his favorite novel—a Victorian-era world of steampower, aether guns, corsets and goggles. And a world where he meets the lovely, red-haired, airship captain Octavia Pye. Like all of Katie’s books, STEAMED is clever, funny, and sure to delight her legions of fans as well as newcomers to her work. Katie MacAlister has worked as a bird skeleton cleaner, a wave machine solderer, a Fortran programmer, and a sales assistant for Harrods. She lives with her husband and two dogs outside of Seattle. Her website is www.katiemacalister.com.